Democrats conducting presidential oversight will soon have legal authority to demand answers from the Trump administration. That doesn't mean they'll get them. WASHINGTON — When Democrats take control of the House next year, they will find themselves with new powers to investigate and embarrass the Trump administration. But their ability to use those powers may be more limited than many progressive voters may imagine. The liberal wish-list has been circulating for months, and Democratic base voters are hungry for results. Some Democrats say their top priority is obtaining President Donald Trump's tax returns, which he has repeatedly refused to release since 2016 because he's said they're under audit by the IRS. Many have their eyes set on unanswered questions surrounding Russian interference in the 2016 campaign, looking to employ subpoena authority to bring in current and former Trump advisers and secure key documents. Over the past few days alone, House Democrats have spoken of probing the firing of Attorney General Jeff Sessions, and the president's possible role in hush money payments to alleged former paramours Stormy Daniels and Karen McDougal. And some voters — though few of the lawmakers who represent them — have expressed a desire for the House to deploy the thermonuclear presidential oversight option: impeachment. But long before Election Day, Democratic leaders were looking to temper the most ambitious expectations of their caucus and their voters. With continued Republican control of the Senate, and a White House staunchly resistant to Democratic requests, the new House majority's road to stiffer oversight is likely to be littered with legal obstacles and hit dead ends — not to mention some tricky political terrain. The holy grail for the president's Democratic pursuers: the tax returns he first promised to release as a Republican primary candidate before appearing to effectively abandon the pledge as president. Now some congressional panels with the authority to obtain those documents — such as the House Ways and Means Committee, which has the ability to request a person's tax returns under the tax code — will be led by members with the desire to put those abilities to use. The incoming Democratic chair of that panel could submit a written request to the IRS to provide the information. If the Treasury Department were to deny it, House Democrats would have to decide whether to pursue the tax returns through a legal route. If they were ultimately obtained, the chair would have to designate the panel's members as "agents" to read the returns. They would then have to vote to make the documents public and report them to the full House. If the Treasury Department completely blocked the release of the records, "that would be illegal," said David Cay Johnston, Pulitzer Prize-winning investigative journalist and expert on Trump and tax law. "The reason that would be illegal is that the statute says that they 'shall' produce the returns. It's not 'may' or 'can' or something else. It is a mandatory act," he said. "Unless they get the most extraordinary partisan judge, then what will happen at the end of the day is very clear: They'll have to turn them over." 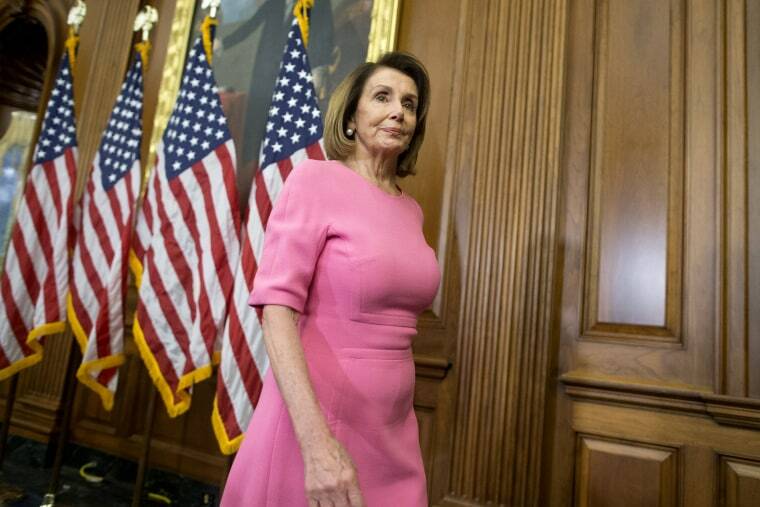 House Minority Leader Nancy Pelosi, D-Calif., told The San Francisco Chronicle in early October that demanding the president's tax returns "is one of the first things we'd do — that's the easiest thing in the world. That’s nothing." Last week, Pelosi said that she'd leave it up to the committees themselves to decide. Trump, however, has already signaled that he's not interested in playing ball. If he's investigated, he said at a news conference Wednesday, hours after Democrats claimed their House majority, then Democrats could find themselves getting investigated right back, by Senate Republicans. What's more, he added: Policy deals could be off the table. "If that happens, then we're going to do the same thing, and government comes to a halt, and I would blame them, because they now are going to be coming up with policy," he said. Democrats will also have the subpoena power in their arsenal — and, based on their efforts in this congressional term, they're itching to use it. During Trump's presidency so far, congressional Republicans have blocked more than 52 subpoena requests by Democrats on the House Oversight Committee, including requests for documents related to everything from alleged housing abuses by the company run by presidential son-in-law and adviser Jared Kushner's family to the Justice Department's refusal to defend Obamacare in court. But just because they can now issue subpoenas doesn't mean they will necessarily issue as many as some voters may expect — or that they can count on getting the information they're looking for anytime soon. "Subpoena power is interesting," Pelosi said at a recent CNN event. "To use it, or not to use it? It's a great arrow to have in your quiver in terms of negotiating on other subjects. But getting back to what we will do, what we will do is exercise oversight, which is the responsibility of the Congress of the United States, exercise oversight over the agencies of government, which this administration has completely walked away from." Laurence Tribe, constitutional law professor at Harvard, cautioned this week that the subpoena power wasn't a magical one. "Hate to say it, but counting on a Democratic House's subpoenas to unlock all the secrets of this corrupt administration could prove naïve," he tweeted. "A Trumpified judiciary, expanded further with the Senate's acquiescence, might let the Trumpsters stonewall. So democracy remains endangered." After Republicans took control of the House in 2011, they issued subpoenas to the Obama administration on Operation Fast and Furious in which for two years, a branch of the Bureau of Alcohol, Tobacco, Firearms and Explosives allowed illegal gun sales in order to track sellers and purchasers. "The White House tried to ignore our subpoenas related to Operation Fast and Furious. We took them to court and won," said Kurt Bardella, who served as deputy communications director and senior adviser to Rep. Darrell Issa, R-Calif., when he led the Oversight Committee. But the road to a final victory was a long time coming. The House started investigating the operation as soon as Republicans assumed the majority in 2011, ahead of President Barack Obama's re-election bid — but despite apparent judicial wins were still battling the Justice Department over documents long after Obama had left office. The DOJ seemed to finally reach a settlement in 2018 — only to see that potential agreement thrown into question last month. And ironically, the Republican fight for Obama-era documents may have left Trump with fewer legal options in his own fight to keep documents from opposition investigators. If he opts to try, beyond legal issues, there can be political risks to stonewalling subpoenas. "(Trump) will look like he is trying to hide something that he shouldn't be. He will be entering into unprecedented separation of powers territory," added Bardella. "We use to say at Oversight, it's not the crime, it's the cover-up that gets you. By refusing to comply with the legislative branch's constitutionally protected oversight authority, Trump could do himself even more harm than the actual investigations would produce." That is, if he were inclined to second-guess a politically risky maneuver. Some Democratic members of Congress have floated the idea of impeaching Trump. But most haven't — including the party's leaders. In an NBC News Exit Poll, a majority of voters in the midterm election this year — 54 percent — said that they don't think Trump should be impeached, while 41 percent said he should. Pelosi herself suggested in an interview with PBS NewsHour that aired on election night that impeachment won't be her focus — for now. "It depends on what happens in the Mueller investigation," she said. “But (impeachment) is not unifying. And I get criticized in my own party for not being more supportive, but I'm not. If that happens, that would have to be bipartisan and the evidence would have to be so conclusive." By introducing a seemingly impossible standard — bipartisan impeachment buy-in in a bitterly divided Washington — it might appear Pelosi was effectively ruling out the idea. She's been at pains to stress that she hasn't. "Recognize one point," Pelosi told The Atlantic's Edward-Isaac Dovere Friday after the election. "What Mueller might not think is indictable could be impeachable." In the wake of the election this week, many Democrats said that any discussion of the "I-word" is premature. "I haven't seen any evidence yet that would raise that, so it seems like you're skipping a few steps there," Rep. Conor Lamb, D-Pa., said on CNN. "There's a special counsel who's looking at the whole problem. We need to give him the time and space to do his job, and at any time that he finishes and presents us with his conclusions, we'll make a decision at that point." Rep.-elect Mikie Sherrill, D-N.J., told MSNBC that she’s not interested in impeaching the president. "You know, I don't think that’s the way forward." Rep. Eric Swalwell, D-Calif., told NBC News last week: "My sense was that health care was on the ballot and not impeachment. We should lead with the reasons the voters gave us the majority." "But we shouldn't look the other way. If there's a line of evidence to pursue, we should pursue it and do it responsibly and put together an impenetrable case that could receive bipartisan support," said Swalwell, a member of the Judiciary and Intelligence Committees. And as Hill Democrats are quick to point out, the odds of a Republican Senate voting overwhelmingly to remove a Republican president impeached by a Democratic House currently lie somewhere between slim and none. Meanwhile, as the Senate's GOP leader pointed out last week, his party paid a steep political price two decades ago for ignoring the partisan headwinds surrounding their decision to impeach a president. In fact, Senate Majority Leader Mitch McConnell, R-Ky., warned House Democrats Wednesday that any Trump investigations under their new majority over the next two years "might not be a smart strategy." "The whole issue of presidential harassment is interesting. I remember when we tried it in the late '90s," he told reporters. "We impeached President Clinton. His numbers went up and ours went down."